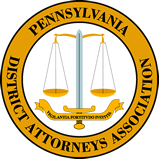 The PENNSYLVANIA DISTRICT ATTORNEYS ASSOCIATION was formed in 1912 for the purpose of providing uniformity and efficiency in the discharge of duties and functions of Pennsylvania’s 67 District Attorneys and their assistants. The Association today continues to further its purpose through its support of training programs, and by its reporting of legal and legislative developments of importance to Pennsylvania prosecutors and their colleagues within the criminal justice system. Moreover, the Association continues to operate as a vehicle for the effective exchange of information among its approximately 1,200 members which primarily include current District Attorneys and their assistants; former District Attorneys and assistant district attorneys; deputy attorneys general; Assistant US Attorneys; and police chiefs. The Association produces a quarterly electronic newsletter, The Higher Standard, which contains national and statewide news of law enforcement issues, updates on Association and Institute programs, and items of interest to Association members. The Association also holds two major annual conferences. The MID-WINTER MEETING, held alternately in Pittsburgh and Philadelphia in February of each year, features training seminars sponsored by the PA District Attorneys Institute (see below), and Pennsylvania legal update sessions. The ANNUAL SUMMER MEETING is held at a Pennsylvania resort each July, and offers a casual setting for an agenda which includes the annual business meeting, seminars, networking, round-table discussions, and recreational and social activities. The Association periodically mails to all District Attorneys’ offices notice of recently enacted or moving legislation of importance to District Attorneys. Through the Association’s statewide telephone and e-mail network, District Attorneys are also contacted by members of the Executive Committee to actively participate in legislative efforts which will impact on the prosecution of criminal cases, victim rights and public safety. Periodic trips have been made to Harrisburg to meet with Pennsylvania senators and representatives to address State legislative issues, and also to Washington, D.C. to address relevant federal issues. The Association is a tax exempt organization under Section 501(c)(6) of the Internal Revenue Code.